Part of the charm of our school is the variety of classes we offer here. We are constantly looking for ways to improve and updating our curriculum in response to the ever-growing global music scene. 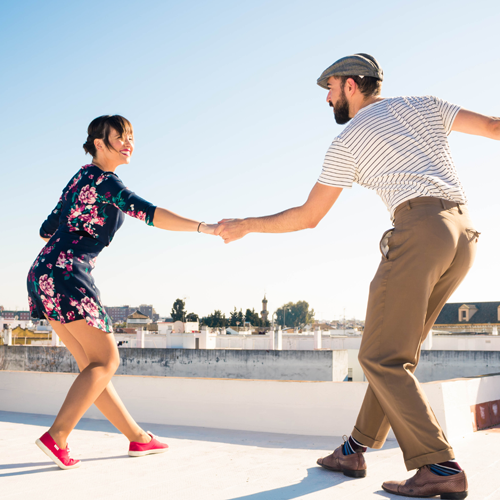 One of the most outstanding courses we are offering here that you will not find anywhere in the country is Swing dancing lessons by our international faculty, María López, from Spain. It is a form of dance that is very intimately connected with the music that we play. It’s incredibly fun and energetic. If you are a musician, you will know and feel the music more if it is a part of you in your body. Check out this video. Classes start from September 11th, every Monday at 6pm at Nritya Aagan, which is just on the lower floor of our building. The package offers 4 classes, 4 social practice sessions and 1 monthly dance with the KJC big band. For more details, call us at 01-5013554 or 9813556945. Apart from this, we have a new class structure that spread the study of harmony and rhythm as separate courses. The harmony class focuses on notes and how they sound together. You will know what is different about the song you like that makes it that way. For example, you will know why reggae or rock or Nepali folk tunes have their distinctive qualities that differentiate them. From this you will be able to play any style, or even mix them creating styles of your own. There is one more component, though, which music is built upon, an even more fundamental primordial element. Music was probably discovered by early humans in the beat of hitting surfaces together, imitating the pulsation of their hearts. This is rhythm, the beat of life, music in its most primal form. Rhythm focuses on time, this being the other component of our music classes. The classes for rhythm will be applicable for every instrument. It will be most valuable to percussion players who want to play ‘in the pocket’. Besides that, we also have ear training and composition classes, as usual, for people that have been with us for at-least one semester. Please visit us or call us at 01-5013554, 9813556945 to know more about the new courses that are available to you!